While not the coldest winter, these past few months have created some challenges in our yard. The heavy snow in December splayed the limbs of a lot of evergreen trees. Many have popped back to their original form, while others have stayed bent. If you have drooping limbs that are now brown, and you can safely reach them, now is the time to remove them, so this spring, the surrounding healthy limbs can start filling any gaps. If you have bent limbs that are still green, you can tie them back with a material that wont cut into the trunk. Pantyhose, or an old leather belt work great as well as rope run through a piece of hose wrapped around the trunk to protect it. Do not use wire as it will cut into the trunk, likely killing the branch. You may see a lot of little brown limbs throughout your conifers. Looking closely you will see they are cracked limbs, also from the snow, and they too can be cut out. The warm weather has fooled a lot of plants into breaking dormancy as we are seeing leaves form on hydrangeas and roses. But not all plants are fooled quite so easily, and you may be wondering why some of your plants don’t have leaves. Don’t despair as most likely they are fine. A quick way to tell if your plant is alive is to scratch the bark with your fingernail or pocket knife. 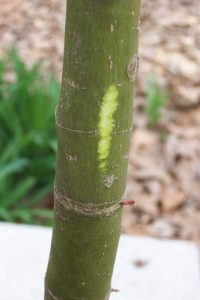 If you see green beneath the bark like in the photo, you are fine. If you see brown, and the branch snaps when you bend it, you know you have dead branches or possibly a dead shrub. Dead branches can be pruned out. Many loropetalums, and azaleas are crowned with brown leaves from the snow and cold. They can be pruned, and fertilized now to prepare them for new growth in the next few weeks. Patience is your friend. Let spring come, let your plants do their thing, then once it’s obvious if a tip of a branch is not putting out foliage go ahead and prune it back to green foliage. I enjoy antique motorcycles. I take pleasure in studying their mechanical details in museums in pristine showroom condition. But what I truly love are old bikes that their owners have made their own. Rather than making the vehicle look like it came off the showroom floor, they make or adapt pieces to better fit their needs. It may be functional like the disc brake on my 1948 Harley, or aesthetical like the huge brass headlight I have. You see the creativity in the machine, and suddenly it becomes authentic. The owner has made the motorcycle his or her own. Our personal gardens are an opportunity to be creative. We get to build what we want. It doesn’t have to be perfect or grand; nor do our gardens have to follow all the rules. Like talking with the guy at the gas station with the greasy, well worn bike we get to share our stories. We get to know more about the owner through his machine in just a short period of time. As you watch him ride away you see the two are on a journey together. When we visit a friend back yard it’s the same. We find out that the iris are fourth generation heirlooms, and the Fairy rose you simply had to have because it reminds you of the neighbor’s garden when you were a child. The hydrangea is in memory of your mother as it was her favorite plant. And that old bird bath you found at a flea market while on vacation ten years ago, and lugged it around the entire trip. When we leave we not only have gleaned more about you, we realize this is your garden; you created it because it was what you wanted. It is authentic. What is leaf mold? Leaf mold is decomposed leaves. Think of a forest floor with years of fallen leaves decaying over time to produce a loamy black soil. 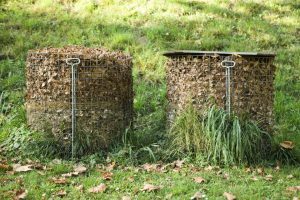 Creating leaf mold is simple, and does not require attention once you start the process. A simple structure to hold leaves while decomposing is using chicken wire to make a 3 ft diameter cage(s) about 3 ft tall to pile your leaves in. Shredded leaves decompose faster, so chipping them is recommended. Otherwise, once you pile you leaves take your weed-eater and shred them. Cover your cage to prevent leaves from blowing out, and let time and Mother Nature do their thing. Shredded leaves may be ready to use by as early as the following spring or summer. Unshredded leaves may take a year or longer to break down. Method two: Spread 2-3 inches of leaf mold on top of your soil, and let the earthworms bring it down into your soil. Method two will bring slower results, but requires less work. A little while back I was out of town, and I called my wife one afternoon to say hi. Asking her how her day was, she responded “I got terrible new this morning, and I am having a great day!” (Insert head tilt, as that’s what I did before she could explain.) After the disturbing news she decided she could let her anger and frustration boil, or she could do something to dampen it. Her “something” was tending to the landscaping in our front yard. Through her slightly labored breathing I could tell she was still working as she told me about the removing of some shrubs and pruning of others, raking leaves for composting and planting daffodil bulbs. She was enjoying herself, and was not letting the morning news ruin her day or dictate her emotions. Feeling only slightly guilty that I wasn’t there to help, I enjoyed the rest of my trip, and didn’t give her actions much thought. Surrounded by nature, even if its just in your yard. In seconds she told me six reasons why gardening as therapy works. You can Google any one of these and you will find studies on how each one benefits our minds and bodies. And here you have them all wrapped up in one! You don’t have to be a professional, and the results don’t need to be perfect. You don’t even need to finish every outdoor chore, just get outside, don your gloves and get started. Like my wife, you’ll be glad you did. A few years back, seven to be precise, a young couple having just purchased their first home headed to the nursery to buy the perfect tree. They both fell in love with a beautiful flowering tree, and took it home to plant. Wanting to enjoy its beauty as much as possible they planted it right outside their dining room window. Oh how they babied that tree, watering it religiously and fertilizing it every spring. For a few years, they watched the tree grow, marveling at its beauty and how wonderful it looked with their house. Then one day they drove up the driveway, and the man stopped the car and just gazed at the tree. “It’s covering up the house”, he said solemnly. “Have you noticed the sidewalk? It’s lifting up right by the tree”, she replied. Shaking their heads, they walked into the house; their once beautiful tree was now a problem. This scenario plays out all too often. With some forethought, and education, our couple could still be enjoying a beauty tree outside their window. Why are you planting tree? For color? Shade? Privacy? Habitat? How tall do you want/need the tree to grow to? As the tree grows, how is it going to affect its surroundings both above ground and underground. Are there power lines above? Will it grow into the house? Will it block the view of the house from the street? Will it shade out too much lawn? Are their septic lines nearby? How close is the waterline? How fast will the tree grow? Will it accomplish what you want in a reasonable amount of time? 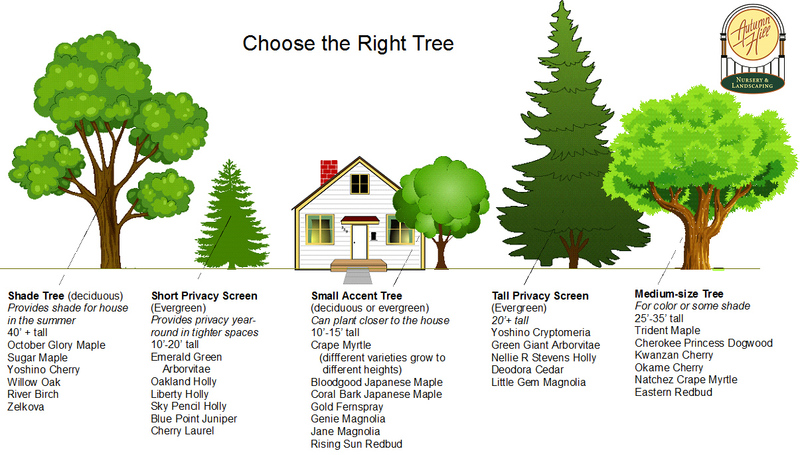 Does the area have the correct cultural conditions for the tree you are considering? How much sun? What about moisture? Does the area stay real wet or too dry? Trees are a fantastic addition to the landscape; adding value to your home while allowing you more enjoyment from your yard. At Autumn Hill Nursery in Woodstock GA we help you choose the right tree(s) for your needs. 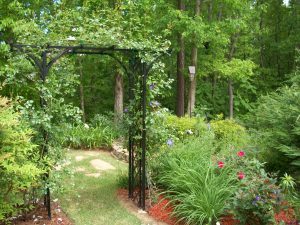 We create gardens for numerous reasons. Sometimes we enjoy the visual excitement of an explosion of color, or maybe to watch the wildlife our gardens attract. Oftentimes it’s a means to escape and relax. Creating a relaxing or meditation garden is not difficult, but it does take planning and forethought with plant selection. One category of plants that can assist in creating relaxing atmosphere is ferns. Used in mass the texture, green color and gracefulness of their fronds (foliage) create a harmonious, soothing effect. One can’t help but decompress just a little when surrounded by a mass of ferns. Combining different varieties of ferns but still remaining monochromatic with the green color scheme increase the soothing effect. A bed of dark green tassel ferns alongside a grouping a lighter green cinnamon ferns is a perfect example of keeping a monotone color scheme. 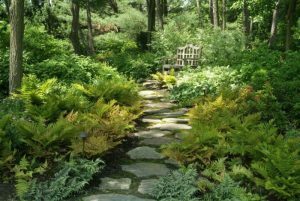 If you have a shade garden consider bordering your path with ferns, or surrounding a bench where you relax with ferns. The cool greens, and graceful foliage will actually entice you to linger longer. 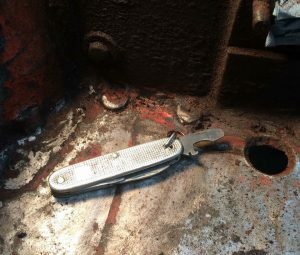 I lost my knife this past weekend. I carried it with me daily for 26 years. My father-in-law gave it to me the first time we met which was about a week after I married his daughter. While being very utilitarian, it has also served as a daily reminder of my family overseas. I can tell myself it’s just a knife but something much bigger has been lost. We all have things that tie us to people, places or events in our lives, and often we enjoy being reminded of them. Why not allow ourselves the opportunity to be reminded more often? It could be a simple as jumping on Google to order that Rolling Stones T-shirt your dad always wore while mowing the lawn, or a little more involved like finding the china pattern your grandmother pulled out for special occasions. Our gardens allow the same opportunity to immerse ourselves in memories. The sights, sound, smells and experiences of our past can be brought to the forefront even if we can’t duplicate exactly what we remember. Maybe you have memories of sharing a swing with your best friend as a child whom you are still in touch with but are separated by three states. Build your own swing in your back yard. It may not look the same or have the same plants around it, but every time you sit in it you will be reminded of why you built it and that will be enough. Remember that tin wash basin on Grandma’s back porch with all the pretty flowers? $50 and two hours, and you are reminded of those wonderful visits. Give this some thought. Who do you want to remember? Make the effort, and reap the reward. You never know who might want to remember what you have done someday. There’s no denying that a lawn with beautiful grass is more pleasant than a lawn without. The most efficient way to establish a lawn is sod. Where seeds can take weeks to even begin to germinate, sod from Autumn Hill Nursery in Woodstock comes fully matured, can be installed almost any time in just a few hours, and will be ready for use in a couple of weeks. Stay Cool. A lawn fully covered in grass is up to 30 degrees cooler than asphalt and 15 degrees cooler than dirt. It’s even cooler than rock and artificial turf. 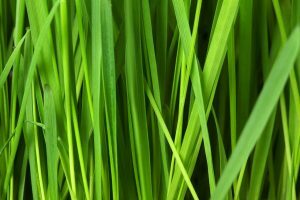 Grass freshens the air, circulates carbon dioxide into oxygen, and reduces greenhouse gasses, which will help your family breathe easier. Keep the Yard Where it Is. Sod starts working to reduce erosion immediately, even on steep hills and slopes. Seeding grass means you’ll have to use other means to control erosion while the seeds germinate and mature, which can take months. Adds Value, Costs Less. A full lawn will add up to 15% to your home’s value. Seeding grass may seem like the cheaper option, and the initial costs may be lower, but consider the additional costs in extra watering, erosion control, and re-seeding, not to mention all the time it takes for seeded grass to be usable. At Autumn Hill Nursery we have over 25 years of experience in landscaping services. When you let us help with your project, you know you’re getting the best service, quality, and knowledge. Give us a call and let’s talk about your landscaping needs! With its mild climate and abundant rainfall, Georgia is a great place to bird watch. Did you know that Autumn Hill Nursery carries birding supplies? To attract birds, you’ll need to create a comfortable environment for them. Birds need a good source food, water, and ideally shelter or nesting areas close by. Provide those in a safe place, and then sit back and enjoy the show! We have all the tools you’ll need to get started. The best way to provide food for birds is shade trees and ornamental shrubs (be sure to select native varieties for best results), though you can of course supplement with birdseed in feeders if needed. Most birds will be excited about sunflower seeds, proso millet seeds and peanut kernels, though of course all species are different. 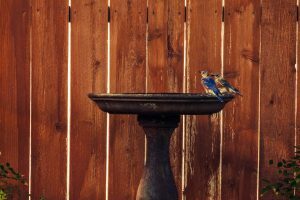 Birds also need a ready supply of fresh water, ideally elevated to protect against predators, no more than two to three inches deep, and replaced regularly. If you want birds to stay long-term, they’ll need a place to be out of the elements. Shade trees are a great choice for this. Look for multi-stem plants with a dense canopy here, as they will encourage birds to linger and even nest. Set up your habitats correctly and you may be able to catch a glimpse of Eastern Bluebirds, Purple Martins, American Goldfinches, Carolina Wrens, Carolina Chickadees, Blue Jays, Downy Woodpeckers, Northern Cardinals, Mourning Doves, and of course the Georgia Brown Thrasher. If you have a big enough source of water, you may even be able to see herons! When you’re ready to get started, contact Autumn Hill Nursery! We love birding and can’t wait to help you get involved in this great hobby. 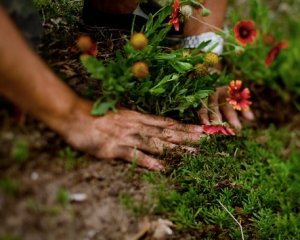 Do you want to start a garden, but don’t have access to outdoor space? Don’t worry, apartment-dwellers; indoor gardening is easier than ever these days. Here are some tips and ideas to get started. Right Plants, Right Place. Many plants actually thrive in the shade, or with just the sunlight from a window. North-facing windows are a great place for plants that need more light. Some plants may like the humid atmosphere of the bathroom! Make sure you keep indoor plants away from drafts and curious pets, and get appropriately-sized containers. Autumn Hill Nursery can help you select the best tools and plants for the conditions in your home. Water Properly. 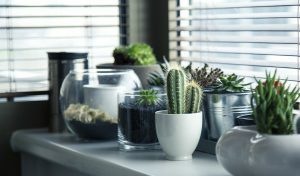 Over-watering is one of the top reasons indoor plants die. Only water when the soil feels dry to the touch. Placing an ice cube or two on the soil (how many will depend on the size of your plant) will help release water at a steady pace. Occasionally misting your plants with room-temperature water will keep them happy, too! Be Creative. Save space by gardening vertically or adding plants to existing furniture like bookshelves, drink carts, and shelving. Small pants can even make an attractive centerpiece for your table. Plant Lights. If you’re really set on growing plants that don’t care for the shade, invest in plant lights to help your sun-loving plants thrive indoors. Drop by Autumn Hill Nursery in Woodstock, GA when you’re ready to start gardening. We can help you create an indoor garden to match your budget, taste, and space!